The Valparaiso University Symphony Orchestra is a select, all-student, symphonic orchestra dedicated to professional standards of performance. The orchestra regularly includes members from all of Valparaiso University’s professional colleges and a wide array of disciplines. Their repertoire includes works from both the standard and contemporary repertories. Domestic tours to cities near and far, including performances in Orchestra Hall Chicago and in Severance Hall, home of the Cleveland Orchestra. The symphony has performed from Minneapolis and St. Louis to Washington D.C. and New York City. International tours with performances in London, Bath, Brecon Beacons, Cambridge, Prague, Pilsen, Linz, Vienna, Budapest, Beijing, Nanjing, Hangzhou, Jiaxing, and Shanghai. 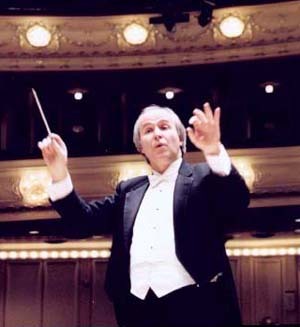 Guest conductors, including Dennis Russell Davies, Bruckner Symphony of Linz; Helmuth Rilling, Bachakadämie Stuttgart; Hermann Max, Rheinische Kantorei and Das Kleine Konzert; Barbara Schubert, University of Chicago; and Craig Jessop, Mormon Tabernacle Choir. Guest artists, including Grammy-winning fiddler/composer Mark O’Connor; Yu Yuan-Qing, violin; Walter Preucil, cello; Maki Namekawa, piano; Zhu Changyao and Song Fei, erhu; and Rachel Barton Pine, violin. Holiday broadcasts on public television stations and on WFMT, Chicago’s fine arts and classical station. Major symphonic works, including Beethoven Symphonies 5 and 9, Brahms Symphonies 1 and 2, Britten’s Sea Interludes, Holst’s The Planets, Mendelssohn Symphonies 4 and 5, Respighi’s Pines of Rome, Strauss’ Death and Transfiguration, Shostakovich Symphony 5 and Piano Concerto no. 2, Stravinsky’s Firebird Suite, Tchaikovsky Symphonies 4 and 5, and Mahler’s Symphony no. 2 in C minor, Resurrection. Oratorio, opera, and operetta collaborations, including J.S. Bach’s Mass in B minor, St. John and St. Matthew Passions, Barber’s Prayers of Kirkegaard, Mozart’s Reqiuem, Vaughan Williams’ Dona nobis pacem, J. Strauss’ Die Fledermaus, Puccini’s Suor Angelica and Gianni Schicchi, Gilbert and Sullivan’s Pirates of Penzance, and Mozart’s The Magic Flute.